Built with the driver in mind, the turbocharged Civic Si Coupe couples with an adaptive damper system to deliver 205 horsepower and a smooth ride on the track or street. Motivated by a 1.5-liter turbocharged 4-cylinder, the Civic Si Coupe boasts a center mounted exhaust and MacPherson strut front damper system. Drivers will also appreciate a close-ratio 6-speed manual transmission with Sport Mode for quick revs through the gears. Visit Premier Honda in New Orleans, Louisiana to find your Civic Si Coupe now! Today's drivers want to stay connected to their smartphone and the streets of New Orleans. Honda designed their new Si Coupe to let you streaming, tune in, or plug in. Connect your Android™ to Android Auto™ to play your music, get directions, and receive messages. For iPhone® users, Apple CarPlay® will also give you these features through a 7-Inch Display Audio touch-screen. If you ever forget where you parked, HondaLink® is for your. Pair your compatible smartphone with your new Civic Si Coupe and your car will remember where you parked for you. 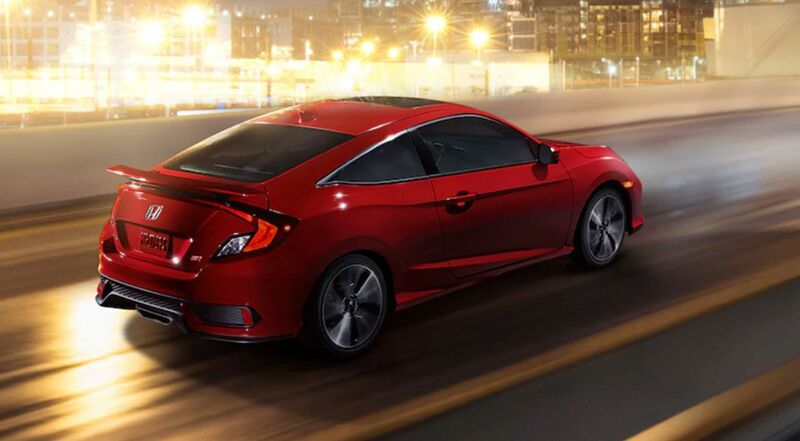 Along with its thrilling performance, the new Civic Si Coupe offers exciting tech. Honda LaneWatch™ activates when you activate your turn signal. Before you change lanes, Honda LaneWatch™ uses the 7-inch screen on the dash to show live video of the lane next to you. Crank up the 450-watt, 10-speaker audio system and enjoy your favorite driving music the way it's mean to be heard. The Multi-Angle Rearview Camera will help you reverse out of tricky parking spots. Ready to go for a spin? If you are on the hunt for Honda lease deals, the new Honda Civic Si Coupe is here. Key systems include a One-Touch Power Moonroof with Tilt Feature, Heated Front Seats, and Projector-Beam Halogen Headlights with Auto-On/Off. Climb into the driver's seat and discover 205 horsepower of Honda performance. The Hill Start Assist also comes standard for those of you who stop on steeper grades. The cockpit of the 2019 Civic Si Coupe provides soft but durable touchpoints, comfortable seating for up to five people, and ample cabin room. Front seat occupants will also enjoy a fully-loaded cockpit with deep-bolstered seats. Accelerate out of the corners and stay in place with these race-ready seats. Push the Sport mode button and enjoy satisfaciton in every gear. The 2019 Civic Si Coupe boasts a menacing gloss black grille, signature red Si badge, and an aggressive sport bumper. Discover the ride feel of 18-inch machine-finished alloy wheels that help accent the car's profile. Other notable design cues include signature taillights, wing spoiler, and center-mounted exhaust. Sculpted body lines and style help push this new coupe to the edge of sytle.